Tagged with: memories • photography • puppy! 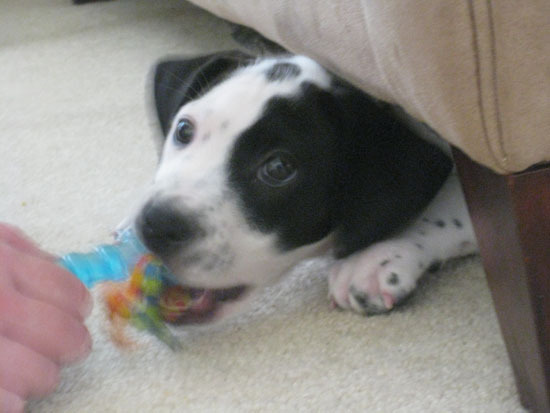 So as you may have eluded from yesterday’s late night, adorable picture, we got a puppy. She’s a beagle, barely 8 weeks old, adopted from someone who was fostering a pregnant momma beagle that came to Florida from Alabama. It’s a possibility that the father is a pointer, but no way to know for sure … we were just told that because of this, she could be upwards of 40-50 lbs, whereas beagles normally clock out in the low-20s. Just between you and me, I really hope that she doesn’t get upwards of 50 lbs! She’s been a lot of fun, though. Already we’ve learned that she’s afraid of beach balls, she doesn’t really care for her leash, although so far she’ll stick close even without it, and she’s curious about the pool … from behind the security of the safety fence, anyways! She’s very much a Momma’s girl (simply because Sara has spent the most time with her), and two days in, she’s yet to actually sleep in her own bed simply because we thought the only way we’d be able to get any of our own would be to just let her crash with us!